Thorough Micad training is the key to ensuring proficient use of your Core Micad IPR and associated Modules. It has been proven that following practical training on the Micad system, global use has increased with more Users engaging in the collation, input and extraction of quality data thereby enhancing the effectiveness of their role. As a Micad Implementation and Support Partner and Approved Trainer, we provide national Micad training on the system to meet the requirements of all Users. As a former Strategic Estates Manager and Micad Administrator in the NHS and a national Trainer and Consultant for a number of years, Marc is well placed to provide the training you require to realise your investment and get the very best from your Micad IPR or any purchased Modules. Our Micad Training sessions are conducted in small groups and generally, where possible on your live Micad system. This ensures that all delegates involved in Micad Training are given as broad an understanding as possible to go away and use the system in an informed manner. Please use the link above to access our Micad Training overview sheets. Each of the sheets has been devised to provide a brief description of the elements of the sessions. We have also provided a link to our Micad Training catalogue to give you an understanding of our courses. We are also able to tailor bespoke sessions to meet your requirements and are happy to discuss this with you. Contact us to discuss your Micad training requirements. With our extensive Micad IPR use and Administration experience we are well placed to provide consultancy, advice and support in relation to the most efficient manner by which to use your system. We can also advise impartially upon potential enhancement of your system through ancillary Module purchases and can advise as to how the IPR can complement your existing systems or protocols. We use the experiences we have through practical “front line” use and from working with a dynamic range of organisations. Should you find that your Micad system is not providing the outputs you require we can assist you in redevelopment or reconfiguration to align the system to your requirements, thereby optimising your use of the Micad system and better realising your investment . Our Auditing and report service is directed toward those organisations that have been using the Micad IPR for some time and require an appraisal of the current system with guidance as to how best to optimise or rectify any deficiencies. We will spend time reviewing your current system beginning with your Core IPR through to installed Modules and will provide a comprehensive report on the current state, offering guidance as to how to make and get the very best from your global system. We will also use our experience to advise upon complimentary Modules which we feel could enhance your system and benefit your organisation. Our Micad Audit and Optimisation Advice Service is guaranteed to enhance your Micad IPR if you implement our advised actions. Our implementation and Project Management Support Service ensures that your Micad IPR is configured to your exact requirements, rendering it ready for your specific use on completion of the implementation project. We can provide full or partial implementation services dependent upon your organisation needs. Where necessary, working in collaboration with other organisations, we will meet with you to discuss and understand your requirements and will then Project Manage the implementation process from a practical perspective, using our experiences gained over a number of years and with a number of organisations. Comprehensive implementation is advised on initial purchase of either the core IPR or associated modules however, should you require retrospective system or module configuration please contact us as we do have experience in this field also. We are a Micad Implementation & Support Partner, meaning that we have proven the quality of our knowledge and service. We are therefore the number one choice for cost effective implementation and Project Management Support. Our Lease, Licence and Terrier Module service is aimed at organisations who would like to hold all of their Occupancy Agreement and Terrier data on their Micad IPR within the appropriate Modules. We will extract data from your current Occupancy Agreements and populate both your Lease and Terrier Modules with the same for easy access and comprehensive reporting functionality. Although it is envisaged that this information may be held elsewhere it is advisable to hold all of your information together, in one place to enhance the interoperability of your IPR and to allow quick and simple reporting. We will configure both Modules to accept the data you will invariably require to inform Estates or Rationalisation Strategies etc and will populate the modules in the most efficient manner allowing you to concentrate on your day job yet still have access whenever required. This service is usually run in conjunction with our Occupancy Agreement Audit or or management services as each service is inextricably linked and more cost effective to run together. As a result of increased interest in this area, we have dedicated a page within our site to this service where you can find out more. Click here to visit the relevant page. What is the Micad IPR ? Micad Systems Ltd is a leading provider of Software as a Service (SaaS), Computer Aided, Facilities Management (CAFM) property management software in the UK. 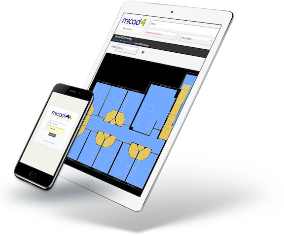 Through their unique and innovative approach to driving their software using CAD space records, Micad provides solutions which enable property professionals to successfully manage their built environment. Micad is the CAFM software platform to house all key estates and facilities management information. Micad is a vertical software platform that covers a range of disciplines including, Compliance, CAD, Space & Utilisation, Room Utilisation and Monitoring, Asbestos Management, Lease and other Occupancy Agreement, Appraisal (Property Surveying), Terrier, Waste and Maintenance Helpdesk. Micad work with a broad client base including, NHS (acute / community and mental health), major universities, private schools, blue chip companies as well as regional property management companies approach ensures that they offer a tailored solution for each property sector and individual client. Their objective is to provide the tools for property professionals to make informed, accurate and information based decisions that will enable reduction in cost, greater efficiency and the ability to meet and exceed compliance with statutory property and work based legislation. As a Micad Implementation and Support Partner and Approved Training provider, we have assisted a number of organisations in the implementation, configuration and training on live Micad Intranet Property Registers and as such bring with us a wealth of experience of best practice. We offer a professional, value for money service to assist and ensure that clients realise a realistic return on the investment made in the Micad System. We also provide consultative advice to those thinking of purchasing the Micad system to answer any practical based queries you may have from a Users perspective. This unique service is borne from the fact that our Managing Director is a former NHS Strategic Estates Manager and Micad IPR Administrator and as such brings with him valuable “hands on” practical experience in the configuration and use of the Micad IPR and all associated modules. In terms of Training, our experience has shown that following the delivery of Micad training sessions, the use of Micad Systems has increased, along with the quality and quantity of useful collected data. This service, complimented by our pragmatic approach to implementation, configuration or optimisation of your existing system will ensure that your IPR is tailored to your specific requirements and used proficiently and productively by those needing to use it. You are free to choose from our standard training sessions or we will be more than happy to build you a bespoke session or package designed specifically around your Micad IPR requirements as an organisation. Sessions can be delivered in a number of ways either on site with your organisation or, should you prefer to be away from the office to allow you to concentrate solely on the subject matter, off site at our offices in Durham City. We can deliver to small or larger audiences dependent upon the subject, from a one to one or up to a group of up to 30 and we will build you a full proposal based upon your group requirements. To the upper right of this page you will find an interactive catalogue to consider or, should you wish to download a catalogue please use the button to the upper left of the page. Please also feel free to Contact Us to discuss our Approved Micad Training or complimentary services in more detail or read our Testimonials to find out what our Customers have to say about the services we provide. For further information on Micad products and services, the Micad Systems website can be visited here or you can contact them by telephoning (0161) 927 95 73 or by email here. Micad Developments IPR 3.5 onward . . . . . . . . . .
“As Micad Systems develop their software from IPR 3.5 onward, the developments will bring with them a number of new features and a large amount of enhanced functionality. Make certain that you and your team are prepared and equipped for the functionality that the developments bring with them to ensure that you continue to achieve the very best from your investment and the broad functionality of your Internet Property Register”. As the long standing Accredited Training Provider and trusted Support Partner to Micad Systems, we are well placed to offer you a range of on-site standard or bespoke courses to suit your requirements. Our training is based on, and delivered against, our practical knowledge and experience within your sector and sessions are tailored to make certain that you realise best value. Contact us using the form below and we will call you to discuss your specific requirements and make the necessary arrangements.